LeBron James was widely considered the best player of his generation, had gone to eight straight NBA Finals, was raking up points and assists game after game. Some people were saying he was better than Michael Jordan and this bandwagon of LeBron as the GOAT of Basketball, still a small one, was rapidly gaining more and more people on its side. And then LeBron James went to the Los Angeles Lakers. Today even the biggest of LeBron James' fans in the media will agree that he is no longer the best active basketball player in the world, a title he had near undisputed claim to for the past decade. Basketball fans today don't even have a consensus on whether LeBron is better than Kobe Bryant, let alone Michael Jordan. Don't believe me? Ask any Laker fan who they would rather have on their team - Kobe or LeBron? There is no denying that LeBron James was the King in the Eastern Conference for the past decade, but it is equally true that the East was by far the easier of the two conferences. That since 1999, the Western Conference has won the NBA Final (winner of Eastern Conference vs Winner of Western Conference) 14 times, while the Eastern Conference Champion has won the NBA Final only 6 times, amply highlights this. For much of LeBron's stay in the East, barring Dwyane Wade, all other stars played in the Western Conference and the teams from the West were stronger than the Eastern Conference teams. James teamed up with Dwyane Wade on Miami Heat in 2011, to start his run of eight straight NBA finals. This team-up was the start of the Superteam culture in the NBA. NBA superstars in the past had valued their rivalries with other superstars, and would never think of teaming up with their rivals to win. They wanted to defeat their rivals, not team up with them. LeBron broke that trend by leaving his team, the Cleveland Cavaliers, and joining Dwyane Wade's Miami Heat. The move bore fruit as LeBron made his second NBA Finals appearance that year and the following year won his first ever NBA Championship. In the four years Wade and LeBron James played together, they won the Eastern Conference all four times and the NBA finals (winner of Eastern Conference vs winner of Western Conference) twice. LeBron then left the Heat and rejoined the Cleveland Cavaliers for whom he won one more NBA championship, and made the NBA Finals in the other years. LeBron, thus won the Eastern Conference eight consecutive times, 9 times in total. LeBron's dominance of the East was phenomenal and his game comprised of far more than only scoring. LeBron is one of the best passers of the basketball and is the only player in NBA history to be in the top five all-time point scorers as well as the top 10 all-time assists lists. What is more, he is likely to be the sole member of his club for a long long while, as no one else is even close to matching this feat. It could be decades before LeBron gets any company in this regard. Additionally, LeBron James has always been a very impressive rebounder of the basketball. Points, Assists, Rebounds - James delivered high numbers in all three of the primary stats categories night after night while playing in the Eastern Conference, and he always won the East (although he went onto lose the NBA Finals 6 times, winning it thrice). His critics though always pointed to the fact that it was easy to dominate and win in the Eastern Conference against weaker teams, and that LeBron would struggle to live up to that kind of consistency in the West. There was no way to know unless LeBron joined a team in the tougher Western Conference, and that happened at the start of the 2018-19 NBA season with him joining the LA Lakers. The results so far have been nothing short of disastrous and the Lakers are practically out of the playoffs, although they aren't out of it mathematically yet. The critics are out in force going "Told you LeBron couldn't do it in the West." The truth is that LeBron's individual stats offensively are still impressive and almost on par with what he did in the East the previous year. However, LeBron James, who couldn't stop winning the Eastern Conference, failing to even make the playoffs in the West, doesn't look great. His fans will deny it, but it does devalue his run of 8 straight finals at least a little bit. "Not so easy in the West, LeBron, is it?" or "Toughen up, you are not in the East anymore", are some of the taunts regularly thrown LeBron's way. What has truly hurt LeBron the most is his own attitude when faced with a run of poor results. After the defeat to New Orleans who were playing without, their star player Anthony Davis, and placed even below the struggling Lakers in the West, accused his team-mates of lacking urgency and being "comfortable with losing". “Everyone’s so accustomed to the losses that I’m just not accustomed to, I’m not accustomed to it. I’d never get comfortable with losing," he said speaking to the media after the game. In press conferences following defeats, LeBron has accused his teammates of not knowing how to win, of being afraid to be uncomfortable, of being distracted, among other things. Such public outbursts from LeBron against his team-mates have left the NBA fans and especially the Lakers faithful very unimpressed. This has left an even worse impression, because, even though LeBron has kept up his offensive numbers, defensively he has been a liability for the team. There have been many clips dissected by the NBA experts/pundits, where LeBron hasn't bothered to chase back or run to close the shooter leaving the shooter wide open and overall LeBron has shown a general disregard for his defensive duties. There was a crucial game against the Clippers where LeBron's teammate Kyle Kuzma had to shove LeBron James towards a shooter to close him down. It worked and the shooter missed the shot. Maybe the Lakers should try that defense more often. Kuzma shoves LeBron James (No. 23) to close the open shooter. 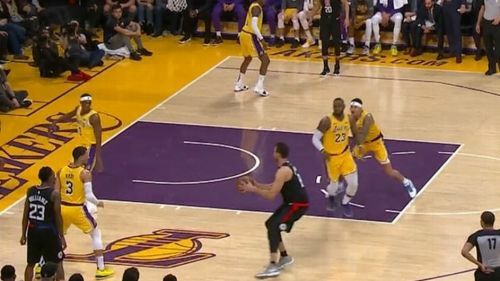 Pete Zayes of Lakers Film Room, who provides in-depth analysis of the Lakers games, said "LeBron rarely exerts himself beyond a casual jog in transition defense and disregards spot-up shooters in most half-court situations, leaving them wide open. His defensive game these days resembles a disinterested center rather than the high-end wing defender." Then there was the Anthony Davis trade issue which completely tore apart the Lakers team unity. The Lakers tried to bring in Anthony Davis, a highly respected top player, to play alongside LeBron James and in return were willing to trade any and every Laker player. LeBron James did interviews where he spoke of his desire to play alongside Anthony Davis and this created mistrust between him and the rest of the Lakers squad. The Lakers eventually didn't get Anthony Davies and LeBron James was stuck playing with the players who thought LeBron wanted them moved to another team. 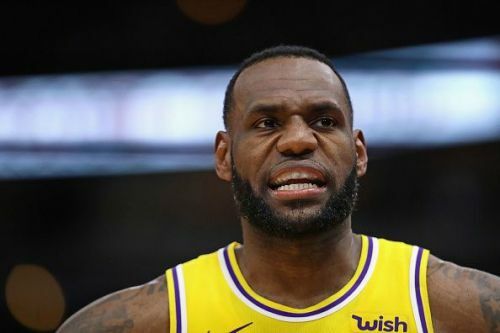 An anonymous League executive in an interview to Bleacher Report said that LeBron killed the Lakers' Chemistry with the Anthony Davies trade issue. LeBron has constantly tried to distance himself from his teammates and there have been timeouts and breaks where LeBron has been sitting away from the rest of his teammates on the bench or not participating in team huddles. Another factor that hasn't gone down well with the Lakers fans is the question of whether LeBron is even fully committed to basketball anymore. Lakers are based in Los Angeles, the city of Hollywood. LeBron is deeply involved in multiple Hollywood projects including producing rap albums and reality shows. This has led to fans questioning his commitment to the team. At one of the games, LeBron James showed up with a glass of wine in his hand, which impressed nobody. 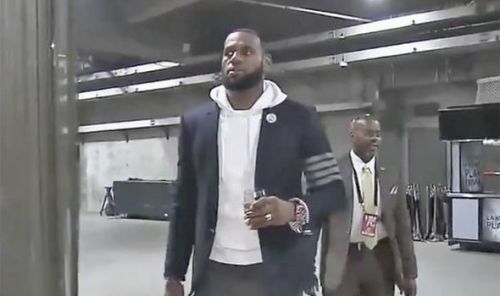 LeBron James showed up for a game with a glass of wine in his hand. As a player, you can't come to the arena for a game of professional basketball drinking alcohol. It is not done. All these issues have left the NBA fans, especially the Lakers fans, deeply unimpressed. Instead of raising his game after moving to the West, especially when the going got tough, and showing more effort, more hustle, more intensity, LeBron shrank, became a defensive liability, and then he pouted and he sulked, and publicly pointed fingers at his teammates, blamed them for the defeats and threw his teammates under the bus at every opportunity. Had LeBron stayed in the Eastern Conference, and had a similar season, he would have gotten a pass from most sections of the media. LeBron had nothing to prove in the East, but he did have to show he could dominate the West like he dominated the East, and he has failed in that endeavor, spectacularly. Where does LeBron James go from this disastrous season? The Lakers squad is likely to be overhauled in the offseason, but people are questioning if any top player will want to play alongside LeBron? Paul George, who is having a spectacular season, passed the chance in the previous offseason to join LeBron in the Lakers and chose to extend his stay with the Thunders. None of the upcoming top free agents this summer, Kevin Durant, Kyrie Irving, Klay Thompson, Kwahi Leonard, are expected to join the Lakers. The media is tipping Kevin Durant, and Kyrie Irving to be on their way to the New York Knicks, Klay Thompson is expected to extend his stay with Golden State, and Kwahi is expected to join the LA Clippers. Lakers players, who could have been worthy trade baits to bring in Anthony Davies, such as Brendon Ingram and Lonzo Ball, are out injured, and their trade value has taken a hit. Why would New Orleans give up Anthony Davies for such players? New Orleans are likely to get better deals from one of the other teams, especially Boston, which makes Davies joining LeBron very unlikely. So do the Lakers continue to struggle with LeBron. This isn't the east where LeBron and any four players equated success. As evidenced by this season, LeBron needs help, he needs another top level player to play alongside him. But it seems unlikely that any top player wants to join LeBron now. Jeff Van Gundy, a former NBA Head Coach, and current TV commentator, suggested on air that the Lakers should look to trade LeBron James. It is a move that could work both ways. LeBron could get to go back to the East on a talented team like Philadelphia which would immediately turn them into contenders, while with LeBron gone, the Lakers could become a very attractive option for top free agents like Kevin Durant. No superstar wants to come to the Lakers and play in the shadow of a declining LeBron James. That being said, there is unlikely to be any LeBron trade, if for no other reason, than the fact that LeBron is unlikely to fetch as much in a trade following this disastrous season. Till the previous year, NBA GMs would have torn apart their teams to land LeBron, but those days are long gone. Lakers and LeBron need to find a way to make things work because another disastrous year like this could do a lot of harm to LeBron's legacy.